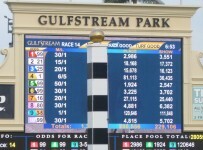 Fans who were expecting four stakes races at Gulfstream Park on Saturday will instead see five. 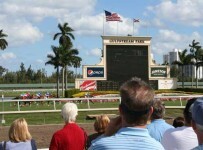 That’s because 23 horses were entered for the Tropical Park Oaks, with a $75,000 purse. Rather than putting nine horses on an also eligibles list, Gulfstream decided to split the Tropical Park Oaks into two divisions. Both have $75,000 purses and are 1 1/16 miles on turf for 3-year-old fillies. The two divisions are the seventh and ninth races. They are part of an 11-race card with first post of 12:00 p.m.
We will have previews starting later this morning on our blog , which can be accessed at the top of the home page of this Web site. Saturday’s featured H. Allen Jerkens Stakes is the fifth race. It is two miles on turf for 3-year-olds and up. The tenth race is the Via Borghese, at 1 3/16 miles on turf for fillies and mares 3-years-old and up. The 1th race is the $75,000 Tropical Park Derby at 1 1/16 miles on turf for 3-year-olds. All of the stakes except the H. Allen Jerkens are part of the Rainbow 6—with a carryover that has grown to $531,275. It is on races six to eleven.